Olympia has faithfully produced several women's versions of their jackets for many years. 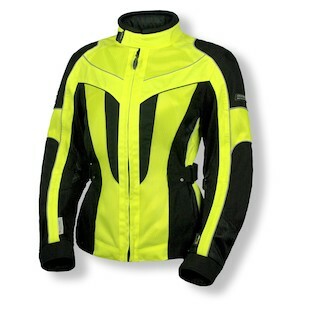 While this appeals the the fashionable passenger for many, it also fills the ever-noticeable gap in functional riding gear for women. These selections are not watered down versions of a men's jacket, but rather fully-featured jackets cut and styled specifically for women. 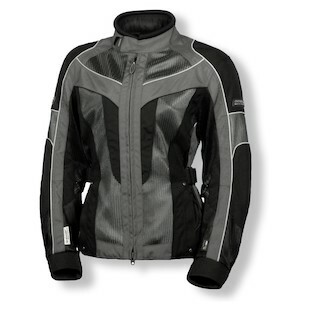 Spring 2013 is no disappointment to this pattern as we eagerly wait for the Olympia Women's Airglide 4 Jacket. Right away, you will notice the complete redesign of the color blocking and the placement of a few new and a few re-positioned mesh panels. While this is a well executed update to the style, it is also a functional upgrade in that the ventilation has actually been improved over the Women's Airglide 3. The fit is fully adjustable, as you would expect, including hip-zips that allow for up to 4 inches of expansion at the base of the jacket. On the inside, the destination layer two-stage liner has also received a face lift. A more detailed finish helps the liner to stand out on its own, while also improving the seal against the weather. There are other carryovers from the Airglide 3, like the reflective piping for nighttime visibility or the neoprene and microfiber at the neck and cuff for added comfort. The launching colors will be Black, Silver/Pewter, Pewter/Black and High-Viz/Black. Overall, we do not expect the line to skip a beat with the Olympia Women's Airglide 4.